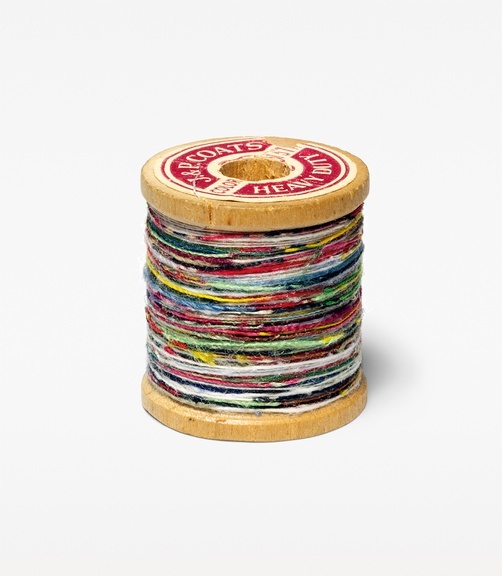 lint, thread, various debris and particles, the artist’s grandmother’s antique wooden spool | For the past two years I have been secretly collecting lint, thread, etc., from friends, acquaintances and strangers (for example a piece of lint on someone’s shoulder, a hair hanging on a forearm.) I have connected all this debris into one long thread which I then spooled. From this spool of debris I repaired a blanket, a tiny pair of mittens, sewn buttons back on, repaired tears in clothes and various other things.